KingofComputing asked: went to your website and found your﻿ ebay, put those in my watchlist so if i decide to buy and grow i'll get them from you, a LOT cheaper then what i was looking at before! just want to know, since it's late in the growing season for us up north, will these seeds keep if i stick them in the freezer like vegetable seeds? SMC: Sweet! Yes, low overhead = low prices, we contract on a very small scale with a few people in central wa who grow the mother plants for us! Yes if you are in the northern states, its a little late to start. The good thing is that the seeds grown for 2011 is a tremendous year with a near 99% germination rate, the most important factor is humidity exposure, but these come in a fresh sealed plastic baggie, so they are stable for a few years so long as you keep them in a cool dry spot. These seeds are very tiny and fragile so I wouldn't recommend putting them in your freezer, standard seed handling techniques do not apply for these babys! You can order either from our website or our ebay listings, I highly recommend the 2011 year, its been the best germination year yet! I think between our growers and our studies, our seeds offer a very high value for your dollar! Bulk Bin section NOW OPEN! Bulk pre-calcualted bundles at the lowest possible wholesale cost! Plus "free shipping" À la carte seeds and qty. growing supplies! 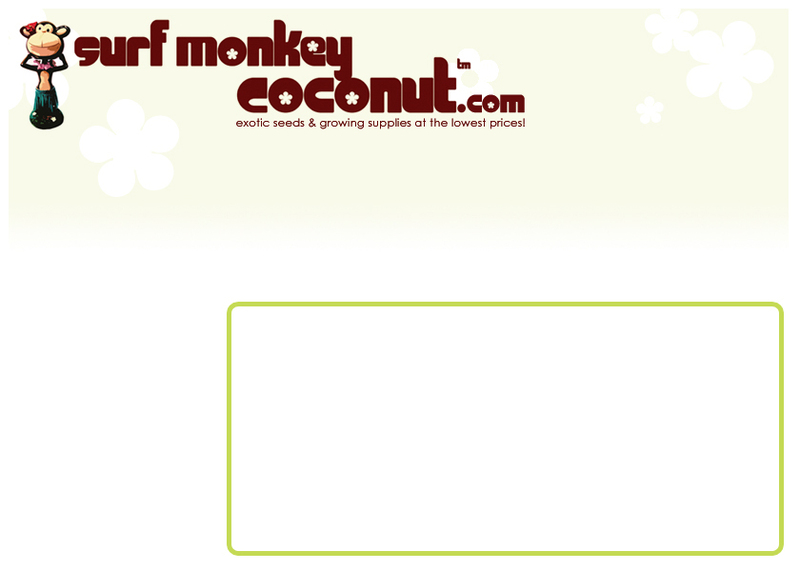 Welcome to the brand spanking new surfmonkeycoconut.com! Your source for affordable exotic seeds and growing supplies! We will be developing this site to be a focal point to address your requests, questions and concerns. In the meanwhile be sure to check-out the above links for our current content in ebay, youtube and instructables!!! Thanks again for visiting and happy growing! Its going to be the best growing season yet! Orders may be placed via the "Bulk Bin Shop" link above or contact me via e-mail below, I am glad to help with any inquiries!